Very quite and clean. The staff was friendly and gave great recommendations. Absolutely first rate hostel with great staff and excellent facilities. 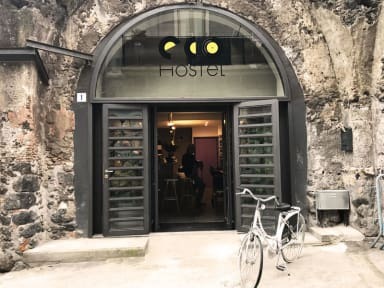 Modern dorms with very comfortable beds, a huge common area, an excellent choice of local beers and a breakfast that will set you up for the day all on the doorstep of the city centre make this the place to stay in Catania. Really cool hostel with great beds, relaxed atmosphere and brilliant common room. This is maybe one the best hostels I have been to. One of a kind, indeed wonderful place with a soul. Clean and fun hostel with amazing management!! They made our stay quite memorable with their recommendation on food!! Amazing staff and good vibes all around! such a lovely time in catania, made friends within the first hour at the hostel :) thank you Gabriele and the others, even though I only stayed for 2 nights, i had an unforgettable stay! Best common/socialising room I have ever seen in a hostel. It even has a film projector! Very modern bunkbeds. My bed was big enough to sleep 2 people actually. They even offer a free welcome drink and breakfast in the price. Located within walking distance to Castello Ursina, Catania cathedral and local restaurants! Worth every penny if you don't mind sleeping in mixed dorms. I would have preferred big lockers for luggage. However they do offer small safes for your valuables. You go with trust! Very much enjoyed my stay at Eco Hostel. 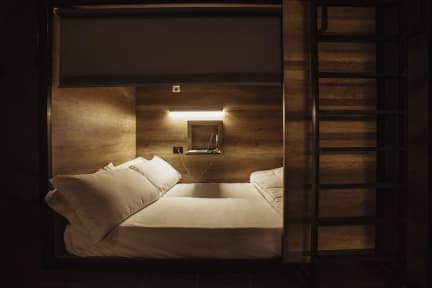 I like the fact that each bed had its own cubby hole and safe! The place is amazing and the staff are so friendly. Rooms are clean and the bed is big and comfortable. Despite the city centre looks dangerous, it is a nice place to be. The only point that could be better is the localization of bathroom and kitchen. The bathroom is downstairs sharing the same area of reception. So if you need to go to the bathroom prepare to face everyone around you. The same happens with the kitchen. The kitchen shares the same balcony of reception and it is not so good.